Stair treads are found on both the interior and exterior of homes. 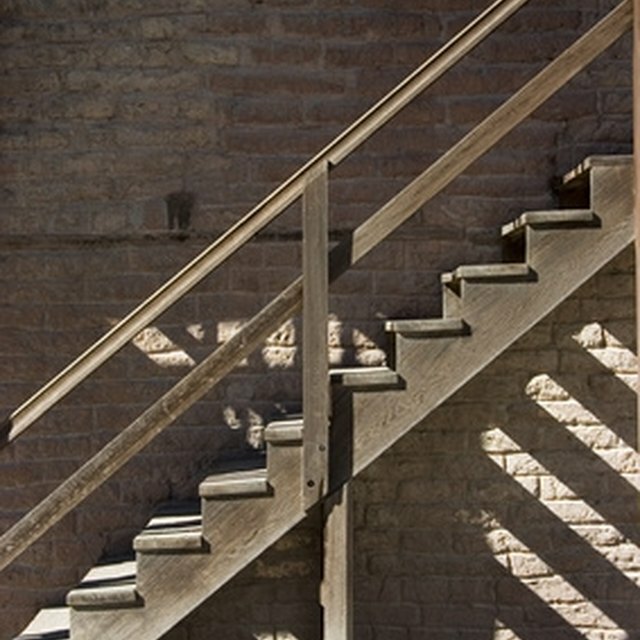 Exterior stair treads are pressure-treated and used for stairs on decks. Interior stair treads can be made out of many different materials, including pine, oak and poplar. These treads are used for staircases going up and down floors of the house. Either way, both of these stair treads are cut the same way. The best way to cut both interior and exterior stair treads is to use a circular saw. Stair treads can be cut with a circular saw. Measure the length of the space where the tread will be installed. Run a tape measure across the stringer and record the measurement. The stringers are the boards the stair tread are installed into. Most stair treads are around three feet long, but that measurement can vary depending on the location of the stairs. Measure the recorded distance onto a stair tread and mark the spot with a pencil. Line up a T-square along the mark and draw a straight line across the entire tread. Set the tread on a flat and sturdy surface. Line up the blade of a circular saw to the mark on the stair tread. Turn on the saw and press down on the trigger to start the blade. Follow the line straight through the tread and run a blade carefully along the line for a straight cut. Measure the piece that were cut and set them on the stringers. Verify the length is correct. Mark on the tread where it hangs off over the stringers so the width can be cut off. Line up a T-square on the mark and draw a pencil line across the tread. Line up the blade of the saw with the pencil mark once again and cut straight along the mark, just as in the previous step. Sand down both cut edges of the tread with medium-grade sandpaper and smooth out the surfaces in a smooth, even motion with the sandpaper. Set the tread on the stringer and verify it is the proper size. Always wear safety goggles when working with a circular saw. This will protect your eyes from flying pieces of wood.